The weeks celebration continues on Tuesday, January 16. Visit the Regency Room in Holmes Student Center between 2:00-7:00 for the Journey Toward Justice exhibit. This walking exhibit introduces visitors to social movements and coalition building across time. At 5:00 there will be a formal program in the Regency Room with remarks and a presentation on historic social movements. Wednesday, January 17, at 6:30, also in the Regency Room, the group Circles & Ciphers will present Circles of Love, Ciphers for Justice. Circles & Ciphers is a hip-hop based restorative justice organization led by youth impacted by violence in Chicago. The group will perform original spoken word poetry fused with written and improvisational hip hop. On Thursday, January 18, the community is invited to the Social Justice Think Tank from 5:00-7:30. The “think tank” will focus on coalition-building, activism, and forward movement across the NIU-DeKalb community. Strong and actionable ideas may receive funding. 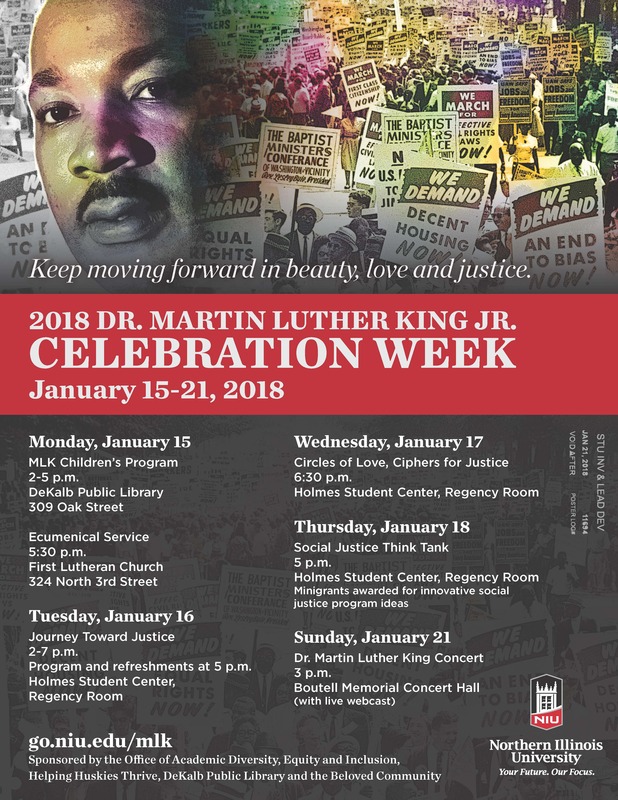 The week concludes with the MLK Concert at Boutell Memorial Concert Hall. The concert will be open to a live audience and streamed online as well. All activities are free to the public and all are welcome. All events are sponsored by the Office of Academic Diversity, equity and Inclusion. Additional sponsors include the DeKalb Public Library, Beloved Community, and the Center for Black Studies. Special thanks to NIU Helping Huskies Thrive Suicide Awareness and Prevention Program for their generous support for the Circles & Ciphers event.